Explore the Winelands of Southern Chile, head to the mystical Easter Islands and see the Maori monoliths. 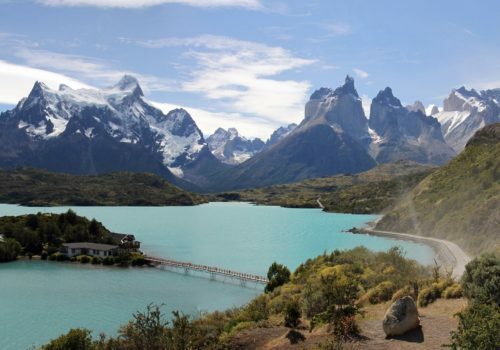 To top it off you’ll return to Chile to explore Torres del Paine National Park in Patagonia. It contains many of nature’s greatest wonders, including huge icebergs and soaring glaciers. When you arrive in Santiago your driver will meet you and transfer you to your wine lodge. You’re free to rest and explore the red wine paradise of Colchagua Valley. This area has been producing wine since the Spanish conquest of the 16th-century. The Carmenere cherry grows here: it is the signature grape comprising so many of your favourite Chilean wines. Today you could cycle around some of the local wineries. This is a great way to see the stunning Andean landscapes. If, however, you’re intending to do an Eddie and Patsy, you could commandeer a driver and set out in pursuit of bolly stolly. You’ll be driven back to Santiago where you’ll fly to Easter Island. Your guide will meet you and take you to your accommodation. Today you can join a guided tour of Easter Island’s iconic Moai monoliths. They were constructed in the Medieval era. No one knows exactly what they represent. Today they are considered to be major works of art. Some of them weigh 13 tons. Today you can visit the Rano Raraku archaeological site and chill on Anakena Beach. You’ll be transferred to the airport for your flight back to Santiago. Overnight in a chic hotel. Today you’ll fly to Punta Arenas and transfer to Torres del Paine National Park. A range of activities are available. You can head on a hike from Weber-Lazo bridge to Laguna Verde and take a boat into the glaciers. Whatever trips you choose your expert guide will ensure it all goes swimmingly. Enjoy another day of action exploring this UNESCO World Biosphere Reserve. A sail down Lake Grey to the great glacier is a must. Today you’ll be transferred to Punta Arenas and transfer to Santiago for your return flight.